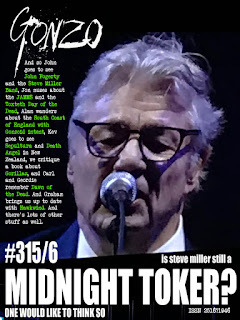 And so John goes to see John Fogerty and the Steve Miller Band, Jon muses about the JAMMS and the Toxteth Day of the Dead, Alan wanders about the South Coast of England with Gonzoid intent, Kev goes to see Sepultura and Death Angel in New Zealand, we critique a book about Gorillaz, and Carl and Geordie remember Dawn of the Dead. And Graham brings us up to date with Hawkwind. And there's lots of other stuff as well. 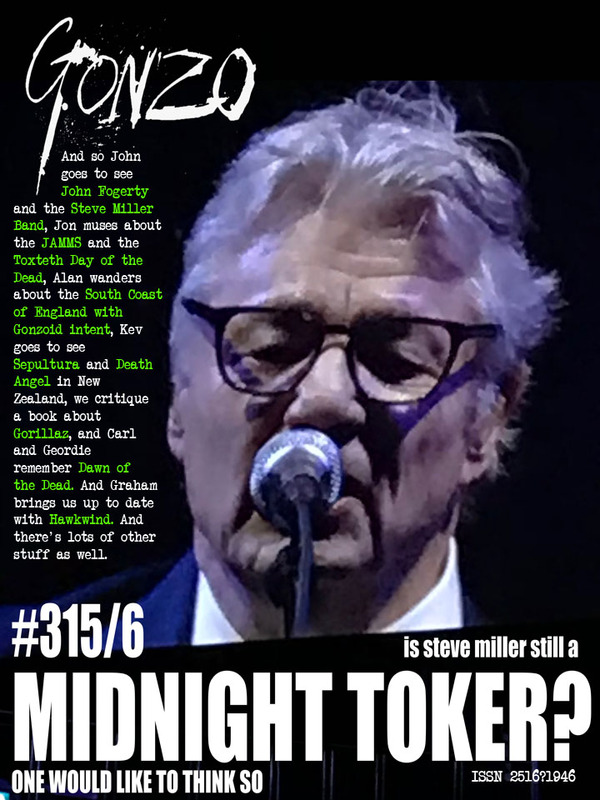 And there are radio shows from Strange Fruit, Mack Maloney, Canterbury Sans Frontieres AND Friday Night Progressive, AND there are columns from Kev Rowlands, and J Stone, BUT Mr Biffo AND Neil Nixon, AND Roy Weard AND the irrepressible Corinna are on hiatus. There is also a collection of more news, reviews, views, interviews and rock wallabies who've blown a fuse (OK, nothing to do with the relatively small macropods who are having electrical problems, but I got carried away with things that rhymed with OOOOS) than you can shake a stick at. And the best part is IT's ABSOLUTELY FREE!!! On top of everything else I have a cold and feel lousy, Corinna and I have a doctor appointment this afternoon, and tomorrow is not just the Toxteth Day of the Dead, but a Full Moon. So when somebody who shall remain nameless telephones saying "I know you told me not to telephone but I thought I would anyway" I think I can be forbidden for what I said next. There will be a Gonzo magazine this weekend, but because there is an important hospital appointment tomorrow I am making no firm promises as to the scheduling, or that of the blogs for the rest of the week. I sincerely hope that these appointments will shed light on her condition, and indicate what her treatment should be. Corinna is mostly pain free, although in discomfort. In the mneantime she is being massively brave. I cannot tell you how much I love and admire that woman. Poor lass has to undergo another batch of tests, and we continue to forge on until something actually happens. Please remember us in your thoughts and prayers. ON THIS DAY IN - 1804 - Napoleon was crowned emperor of France at the Cathedral of Notre Dame in Paris.